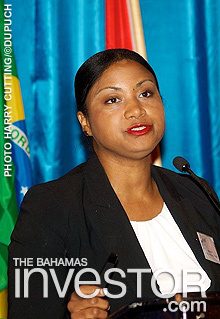 In the wake of the global economic downturn, there has been a shift towards a culture of responsibility within the international financial services sector, according to chief executive officer of the Bahamas Financial Services Board Aliya Allen. In the wake of the global economic downturn, there has been a shift towards a culture of responsibility within the international financial services sector, according to Aliya Allen, chief executive officer of the Bahamas Financial Services Board (BFSB). Other client concerns are whether a jurisdiction has a fair legal system, a history of corruption or an unstable economy, said Allen during an address at the Bahamas International Investment & Business Forum (BIIBF) in Freeport last week. She pointed to the depth of expertise among financial services professionals in the country and said the sector benefitted from a combination of homegrown talent and international expertise. She said the jurisdiction should offer something unique to investors, such as the SMART Fund model, the latest version of which was introduced in August 2012 and is the first of its kind. “I have engaged industry to ensure we are incredibly responsive to international initiatives and first to market with innovative products,” said Allen. Toyota officials and special guests from throughout the Latin American and Caribbean region will arrive in Nassau February 27 aboard the Celebrity Constellation cruise ship as part of the celebrations marking 60 years of company's presence in the region. The redevelopment of Reef Village as a Blue Diamond Resort by Hutchison Whampoa and Sunwing Travel Group is set to begin in the next few weeks, bringing thousands of jobs to Grand Bahama, according to Prime Minister Perry Christie. Watch a ZNS news report on the announcement here.